We have decided that a weekend brunch outing is just about the perfect way to enjoy a family meal together at a restaurant. And when I say brunch, I should clarify that it's occurring before most people are even thinking about breakfast. We looked around us the other weekend and had to laugh -- it was 8am on a Saturday and we were surrounded by families of toddlers, all juggling bibs and sippy cups and snack traps. And chugging coffee. 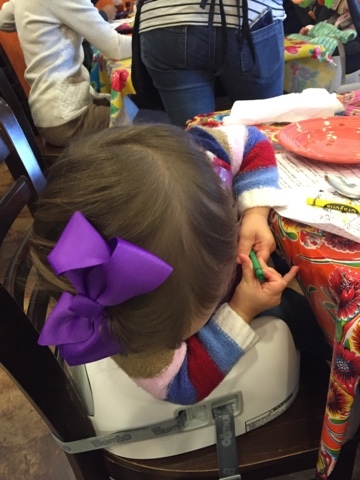 I will say that The Flying Biscuit does a fantastic job of catering to their youngest patrons -- crayons were given immediately, and the food came out with very little wait. 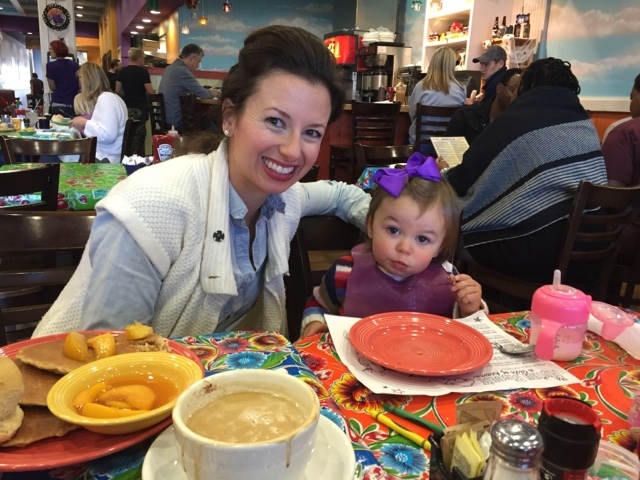 We certainly seek out dining spots these days that are toddler-friendly. I was given an opportunity to put a new-to-me product to the test. Bumbo (a company that needs no introduction to most all parents and caregivers) has a pretty snazzy new 3-in-1 seat that has hit the market. The nice thing about this seat is that it has longevity -- it transitions from baby seat to toddler booster easily and swiftly. This is truly a product that we can, and will, use for years. + The cushy seat insert is perfect for young sitters but removes easily so that more luscious toddler fannies and thighs can fit in (that's us these days). With or without the insert, everything about this seat is easily wipeable, and that is very important! + The seat includes a food tray that (THIS is genius), when not being used, clips right into the back of the seat and sits flush to the plastic. So smart and streamlined. + The adjustable straps that go around the back and bottom of the chair to keep it secure retract completely into the seat when not in use. No messy straps hanging around. This is my #1 favorite feature of the seat. The seat felt completely secure, even with a wiggly toddler. If you are looking for a smart baby gift or building your own baby registry, I would highly recommend looking at the Bumbo 3-in-1. It can be found at Target and other retailers of baby products. 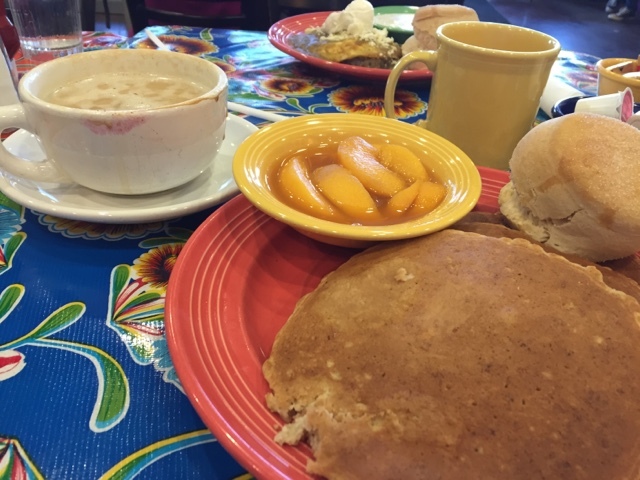 Oh, and if you're ever near The Flying Biscuit, order the Egg-Ceptional Eggs plate. It is everything you would ever want in a breakfast ... and that is no exaggeration! with this awesome booster seat! We totally take a booster seat when we go out now. My 2.5 year old gets out of the wooden high chairs. I find most of them have broken straps anyways. I joke that DHEC should check for properly functioning high chairs. My parents own a few pizza restaurants and I made them invest in the nice plastic high chairs with good safety straps. I might need to invest in this! 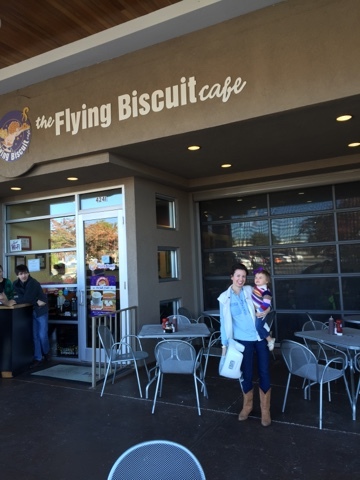 We have a few Flying Biscuits around Atlanta! One of my favorite brunch spots for sure :) We don't have a baby yet, so I can only image what they will come up with in just a few years! 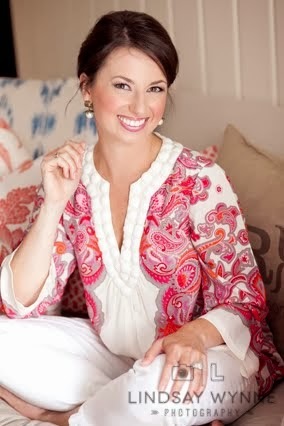 After seeing this seat on blogs this past summer- I was so bummed to have just missed the boat on having one of these (as opposed to the previous version that all of us with those 2014 babies had JUST gotten!). Then I walked into one of my favorite kid's consignment shops a few months ago and picked up that exact turquoise and white one pictured - sparkly and brand new looking - for $20! I was pumped for a full week about that awesome find. I love that it'll get some mileage!! that seat looks so handy! love the luscious fannie part haha I understand that! This would be the perfect seat to use when traveling, also. will really need to look into it! thanks for sharing! You know... I've never thought about bringing a seat of my own to a restaurant! That's a great idea. I've been. So grossed out by sticky high chairs & Emmy won't sit still in a booster seat that I've been putting her in an adult seat & then having to deal with the consequences of that.... I'm filing this away for baby number 2! Great seat with the retractable straps & wipable surfaces! April, do you think this would be a good seat to have at home in lieu of a highchair? 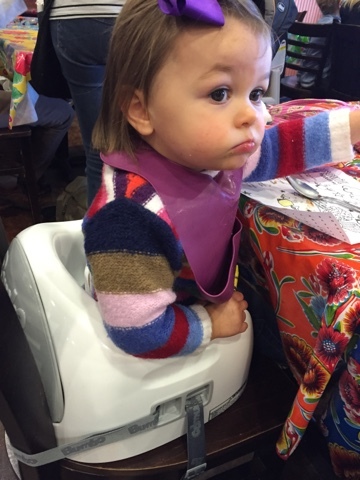 We're tiring of our highchair, and I think it would be easier just to have a booster attached to a regular chair. I have one of these for our 5 mo, but am wondering if we could use one of those clip to table chairs for restaurant outings? I think you posted about one awhile back.. 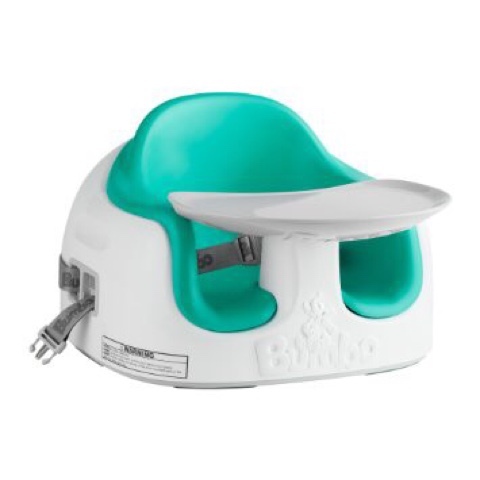 I also have the Chicco booster seat, but this one serves the very same purpose -- plus more. 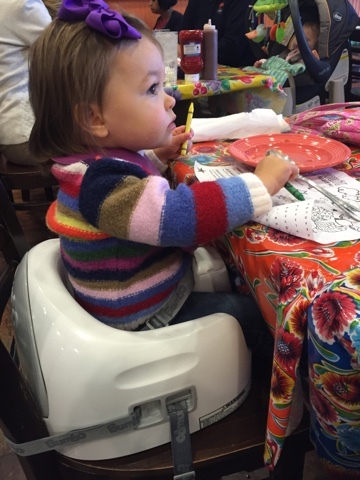 The tray that comes with this Bumbo booster easily converts it into their own little eating space at restaurants. I didn't need it here, so I kept the tray on the back of the seat where it stores easily. So glad I saw this post! Definitely adding this to the next Target trip list! Thanks for sharing!